In this window you can see how much time you spent on projects task categories in a given time period. 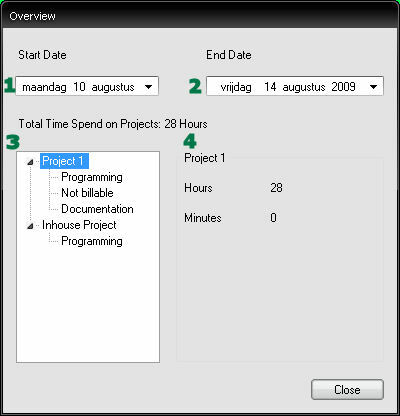 The projects and task categories are visible in a treeview. In this Treeview you can select a project or task category and see how much time you spent on the task category or Project. The first date of the time period. The last date of the time period. The list of all the projects and task categories. Here is listed how much time there was spent on the selected Project or task category between the start and end date.